Above is a picture of the first gyroscopically-balanced in the United States. Louis E. Swinney first thought about monorail concepts in1948 and later would build several prototypes to promote the concept. Believing that so-called conventional monorails needed too much materials for a beam, as well as cumbersome bogies, he thought that gyro-monorails could take transit one step further into the future. Along with his partners, brother Ernest F. Swinney and friend Harry Ferreira, designed and built a small backyard gyro-monorail in 1962 to test the concept at 42nd and Metropolitan Avenue in Kansas City, Kansas. It operated successfully for several years and was demonstrated to the press on several occasions. The small, jet-age finned vehicle traveled along a steel pipe supported on wooden pylons approximately three feet above ground level. The Swinney-Ferreira team also developed a two-wheeled car based on the same gyroscope technology. The Gyro-Dynamics prototype wasn't the first to use gyroscopes for monorails. Louis Brennan's gyro-monorail system was successfully demonstrated in 1909 at Gillingham, England (see History). Gyro-Dynamic's proposal solved balance issues of Brennan system. The Gyro-Dynamics monorail improved on Brennan's design by adding a patented counter-weight system that could shift from side to side above the rail. That weight would counter any side-load issues where passengers or freight might be heavy to one side. Gyroscopes would also be mounted in a way that bank could be controlled to varying degrees, depending on whatever speed the train was running at while negotiating a turn. Back-up side wheels ready to grab beam when powered down. Even though gyroscopes would continue spinning for several hours after a power failure and continue to balance the train, the Gyro-Dynamics Monorail design did have back-up wheels ready extend from the vehicle and grab the sides of the track's support beam. 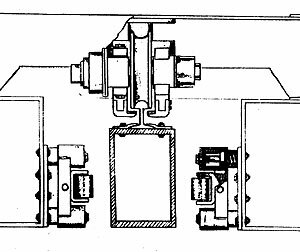 This side-wheel system could also engage the beam when monorail trains were powered down for maintenance or storage. Bogie sketch from Gyro-Dynamics brochure. Double-flanged wheels, similar to those on Wuppertal's suspended monorail, would ride upon a curved-top steel rail. Several different switch designs were developed for the system. Swinney maintained that the simplicity of the guideway would make switches, as well as normal guideways, very economic to build. 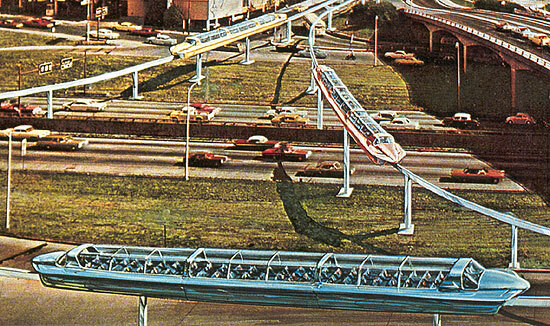 Aesthetics would also be better with gyro-monorail's demure guideway. The Swinney-Ferreira Gyro-Dynamics Monorail, like many other monorail concepts, never made it beyond the test track. However, the gyro-monorail concept still enjoys support. In fact, The Monorail Society found out about the Swinney-Ferreira system from a strong believer, Wes Neal. Neal was a financial supporter for the Swinney-Ferreira's system, and at the time even provided a back yard for one of the prototype test tracks. He tells us that the original vehicle is still intact. Perhaps it's waiting to be showcased in a future Monorail Museum. Wes today owns and operates the Boulevard Drive In Theatre in Kansas City, Kansas, which has operated continuously since1950. Wes still believes the gyro-monorail could be further developed and hopes that someone will do so at some point. Our thanks to Mr. Neal for sharing this unique chapter in monorail history!